About two years ago we thought we would lease to own a fridge and a television from EasyHome as I had been placed on permanent disability from a spinal disease and my wife hasn’t worked in years due to breast cancer. They kindly did all the paperwork and delivered the merchandise to our home. We signed a MONTHLY payment plan. We have faithfully paid monthly $350.00 for over a year and then they came under new management. The new manager took it upon herself to switch us from monthly billing to weekly billing which we had a VERY hard time dealing with because as you can imagine we get paid monthly (which is why we set it up that way to begin with). They started hounding us daily with a massive amount of phone calls and even came to my home multiple times to tell us we weren’t paying on time. We kept explaining we were on a monthly payment schedule and we would have to continue as such. Btw, we kept paying monthly. Over the last two months we have been unable to pay because THEY now decided that WE would have to pay for an extra month that they racked on to switch us BACK to monthly after their mistake. So they now wanted upwards of $750.00. Obviously we couldn’t afford those payments and we told them such and they didn’t care. They kept telling us we had to pay it by coming into the store which we couldn’t due to illness and surgeries, appointments, kids etc. Most of you know my wife and daughter are pretty ill. My wife had major surgery two days ago and was asleep on the couch and we got a knock on he door today. 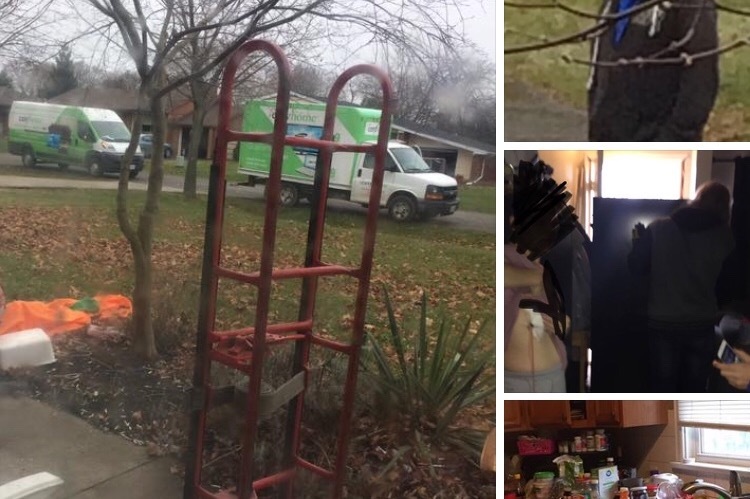 EasyHome reps showed up with a PAID Bailiff from Kitchener to remove the items from my home 1 week before Christmas and two days after my wife’s surgery. I fully understand and take responsibility for not paying for two months but I just couldn’t afford the 750.00 they wanted right before Christmas with three kids. IT WAS ONLY TWO MONTHS FOLKS. This was ultimately there mistake and I just can’t comprehend how they came to this decision in two months. After her surgery..... I had to beg my wife not to lift anything trying to empty the fridge and I took the TV off the mount. We don’t have a fridge now (working on that). I just want everyone in Niagara to stay away and far away from these guys. I’d hate to see this happen to someone else. Pictures show Mr. manager of the local EasyHome store whom was asked not to be on my property so he waited on the road. He was not in anyway shape or form helpful in any way. He made it worse on all of us. The two men that were here to just lift and pickup the items were great. We had no issues with them or the hired Bailiff. So many times in life you just need a little help in life and a wee bit of luck I guess. All I asked of these folks was to put us back to monthly and keep the charges the same and in no way did they even care. I then asked them today to at least give us a bit of time to figure it out or let us make a payment today and they said no way. Please folks, if you are down on your luck and think EasyHome seems like a viable way to deal with things.... don’t do it!!! Go elsewhere. Clearly a man who gives to the community the least we can do is send them a little help around the holidays.